There is something exciting, yet very surreal about falling asleep in one country and waking in another! I left Orlando late evening, sketchbook in hand, and woke as we landed in Frankfurt. Typically extremely efficient and known as a great airport for ease of connections, I had a very tight and stressful 40 minutes to catch my flight to Rome. Security lines were long, Passport Control officers were surly and slow and I thought it would be a miracle if my bags made it. Thankfully both my bags and I made it and I soon found myself in a taxi barreling through the streets of Roma, headed for my hotel on the Via Veneto! I know the cardinal rule when flying overseas is to try not to sleep until it is bedtime in whatever city you are located so after checking into my hotel, I hit the streets for an evening walk to the Trevi fountain and Spanish Steps. It was a beautiful evening and I sufficiently wore myself out, but got one little sketch in before I did. My phone GPS would not cooperate as the signals bounced all over the ancient buildings and I got turned around a few times, but it was a beautiful evening and after all, I was in ROME! After a Giada celebrity chef sighting, I meandered back to the hotel, brain and body feeling like mush and sunk into a cloud of down blankets and passed out. The Hotel Majestic Roma, was once the grand dame of hotels where all the rich and famous would stay. Their autographed glossy photos lining every wall told a glamorous story. She’s now a little worn and aged but still lovely - like an elderly woman that you can just tell was once a real “looker.” My room was cozy and the service impeccable. 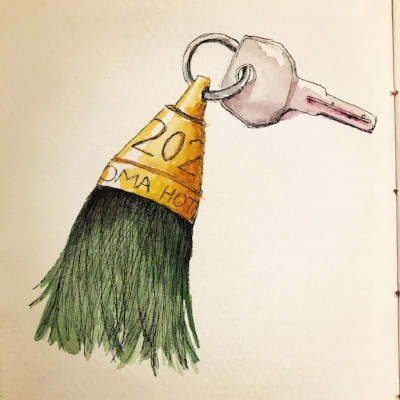 One of my favorite things were the beautiful room keys, heavy brass knobs, the size of the palm of my hand, with giant tassels attached. You can’t imagine how much I wanted to “accidentally” take one of those home! I loved the old-fashioned way you left your key with the front desk as you exited, and picked it back up again when you arrived back. Divine! Another hazard of international travel is trying to get your body clock to adjust, which it does in about 24-48 hours. 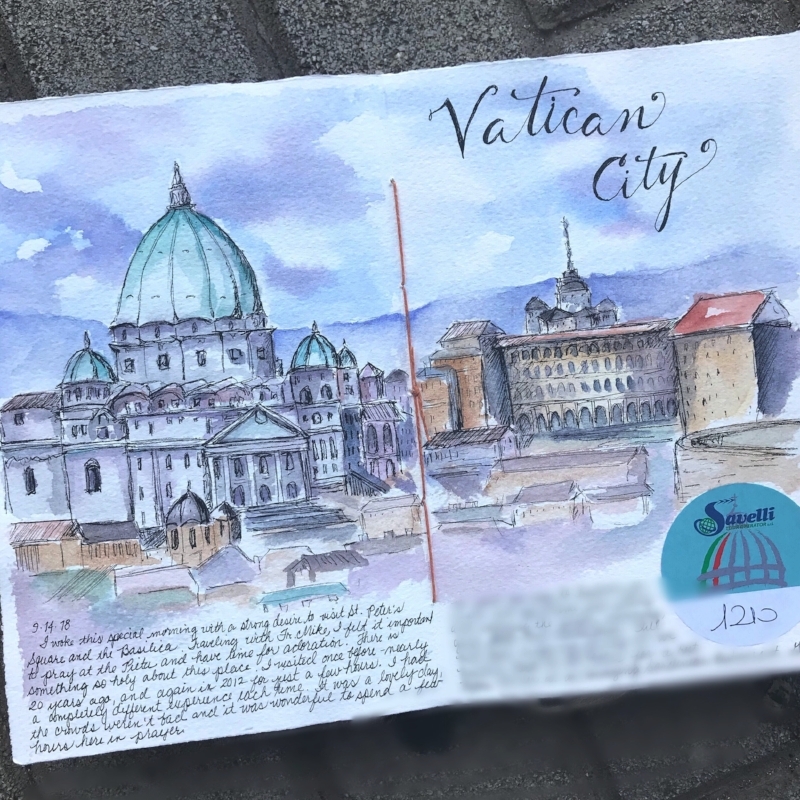 The first morning in Rome, I woke at 4:30 and couldn’t fall back asleep, so I sketched a bit, read, watched the clock, then finally made my way to the terrace for a beautiful breakfast. I lingered over breakfast far too long but couldn’t resist the bottomless cappuccino and glorious spread! Besides, I loved sitting on the terrace of the dining room imaging all the glamorous movie stars from the 50’s and 60’s that sat in the same spot. There was something very chic about sitting on the marble checkerboard terrace as the people and traffic on the Via Veneto whizzed by below and the charming waiters flirted and lavished me with attention. Grazie Mille! 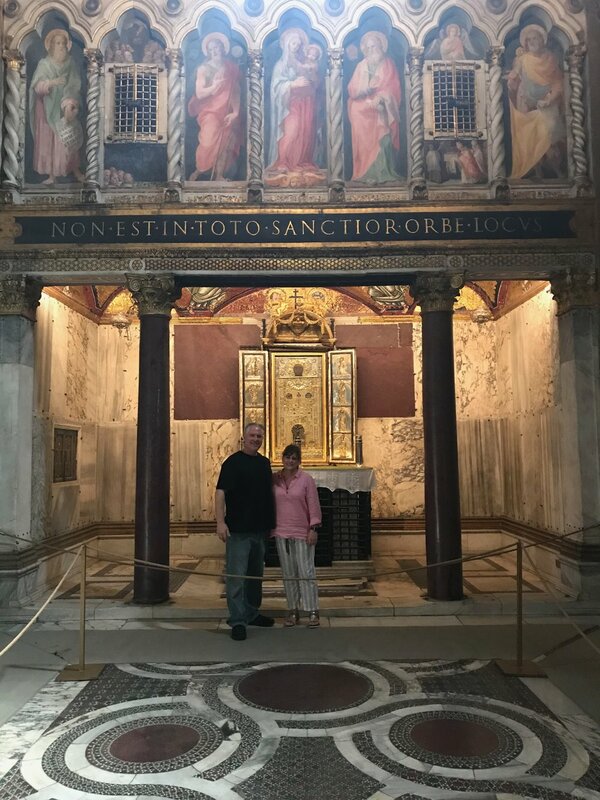 I was happy to be meeting a friend in Rome for the 2 short days I was there - it was nice to have the company, especially since he is a Catholic priest and an expert in all things Rome! What do you do when in Rome with a priest? Head to the Vatican of course! Father Mike and I made our way through St. Peter’s like experts as we hit the high points, knowing how to avoid the crowds. Of course one should NEVER visit The Basilica without first stopping to admire ‘The Pieta.’ This must be my fourth or fifth time here, but I still am moved to tears whenever I see it. Mesmerized, I lingered there and prayed for a long while. 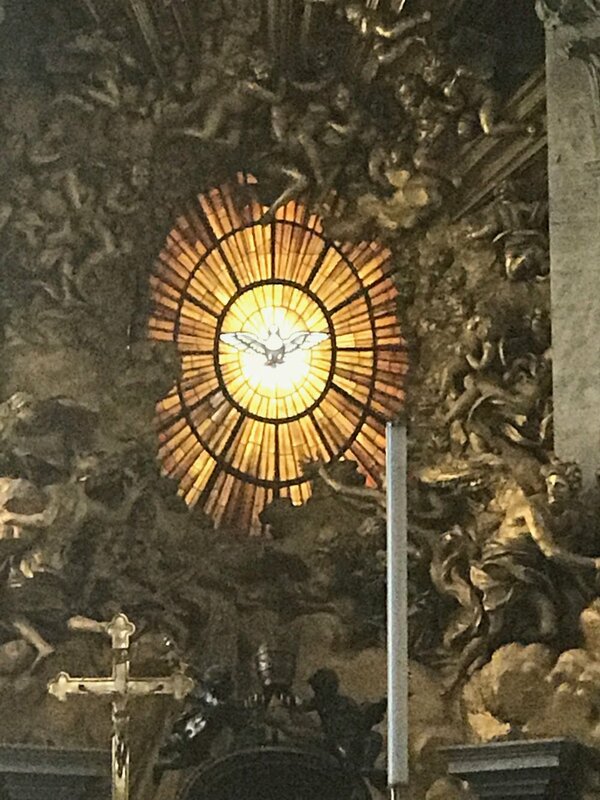 My second favorite stop is always the alabaster window above St. Peter’s throne depicting The Holy Spirit. It always takes my breath away, especially when the light hits it just so. 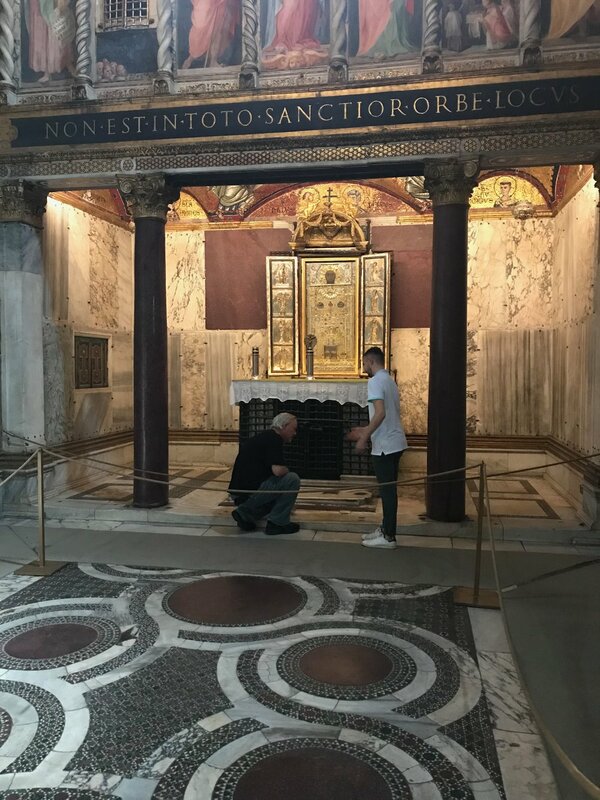 Day two was filled with a trip to St. John Lateran, considered to be the Mother of all Churches in the Catholic Faith. 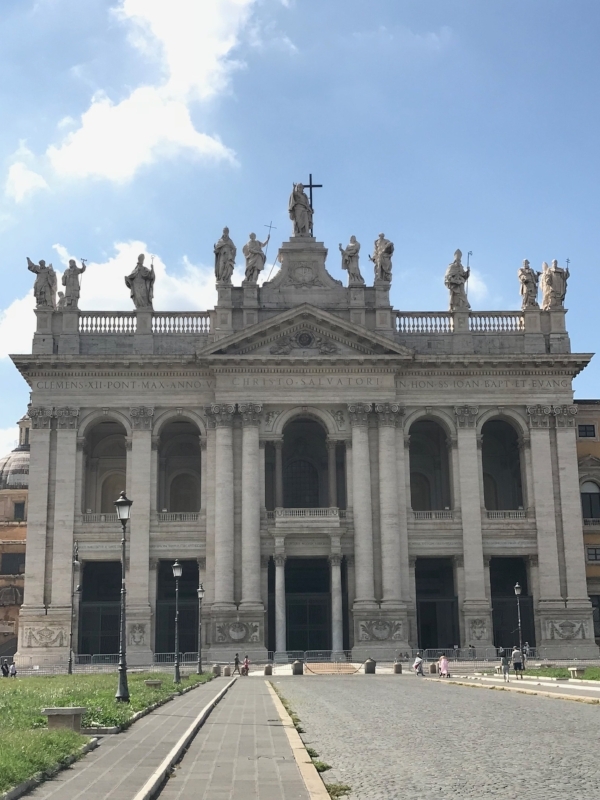 This Basilica is the ecclesiastical seat of the Pope, Bishop of Rome, which means that only the Pope may celebrate Mass here. Within these walls lie some of the most important relics of the Passion of Christ. Just outside the walls, lies the Sanctuary of the Holy Stairs, or the Sancta Scala. It is here that St. Helene, mother of Constantine, brought the staircase that Jesus climbed on His way to the Sanhedrin to stand before Pontius Pilate. Today, Pilgrims may only climb the 28 steps on their knees, as an act of devotion. 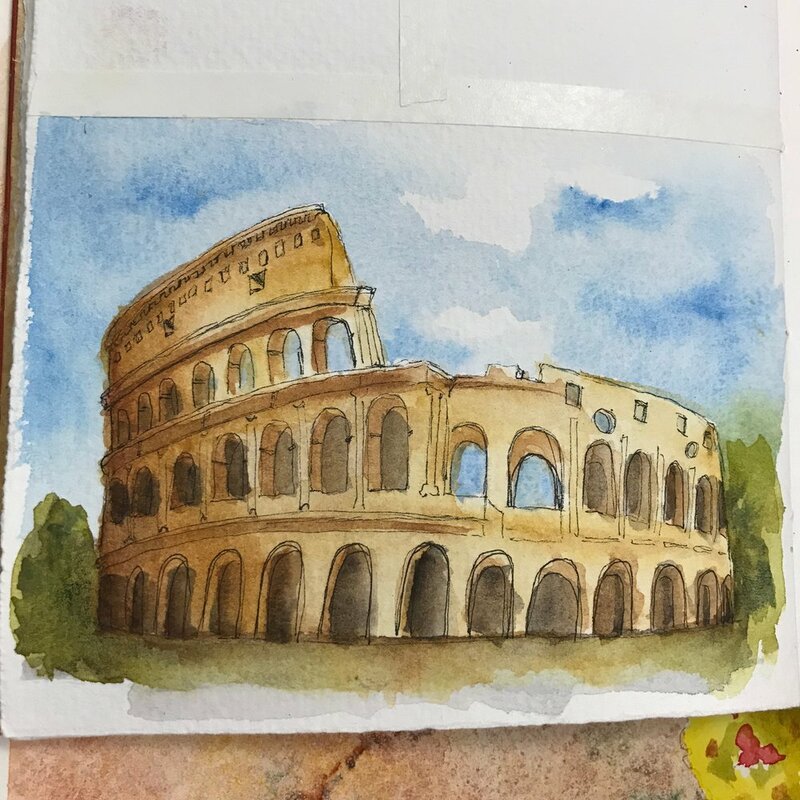 Emotionally drained, we walked the streets in silence, making our way past the Colosseum but decided it was too much of a sensory overload to go inside. 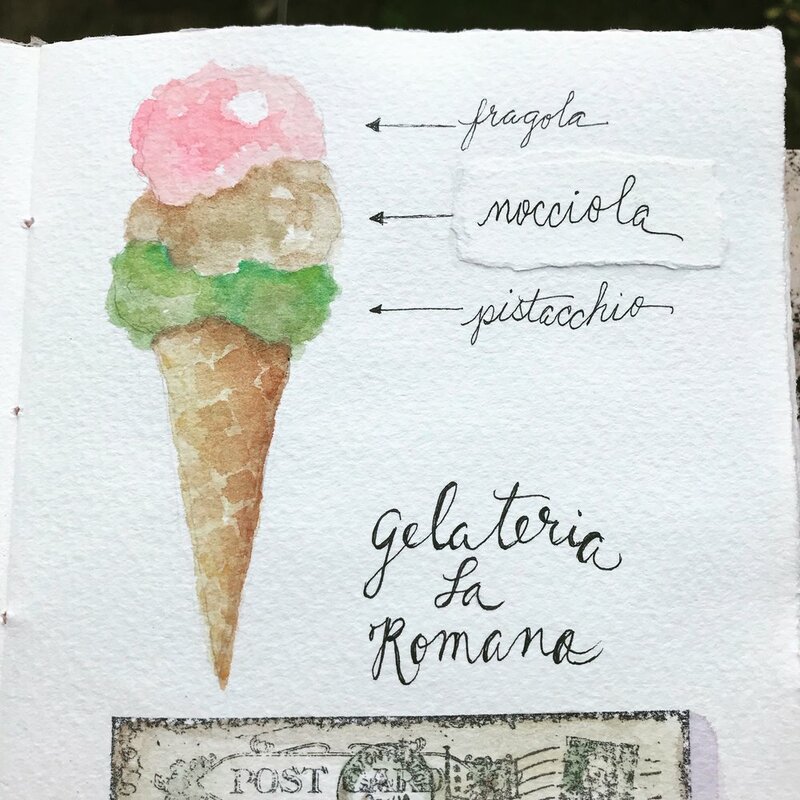 Instead we found gelato, always a good idea, and perched on the Palatine Hill overlooking the Circus Maximus. Better to end the day on a lighter note! A whirlwind trip, but exactly what I needed! The next day, Fr. Mike and I parted ways as I headed North toward Orvieto!